I was at the ShenZhen airport heading to my boarding gate as I was leaving for the GuiLin tournament when I spotted this en route. 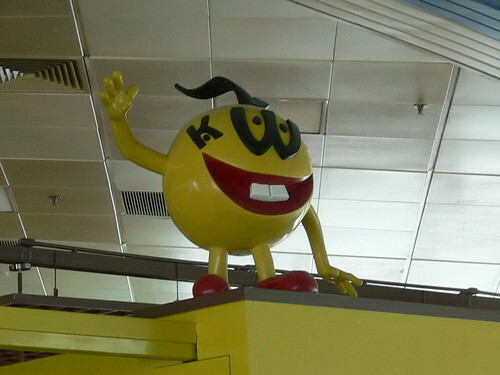 It's the Yellow M&M's long lost evil twin!!! Welcome to Spitland where we have fakes and imitations all over the place. While they say that imitation is the best form of flattery, l say lousy forgeries with the lamest of efforts is definitely hands-down the best form of insult. Really bad job here as I cringed while taking a photo of it. This reminded me of one of those "dumb blonde" jokes. Q: Why was the dumb blonde fired from the M&M factory? A: She rejected all the candies with the "W"s printed on it.